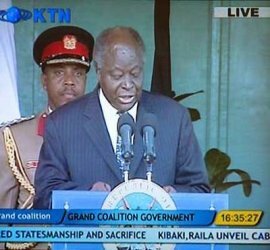 The face of Kenya broadcasting has changed tremendously during the last 15 years. The virtual monopoly of the KBC has ended and new political freedoms have led to a large variety in good quality media, some very critical of the government. All in all, Kenya news media are an example for Africa as a whole. Up until 1990, the Kenya Broadcasting Corporation held a monopoly on the television airwaves. That was the year the first television competitor was launched. 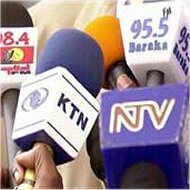 The Kenya Television Network was a hard-hitting journalistic news station that had more editorial freedom than the government-owned KBC. Today there are several more stations on the dial for Kenya. Many of the new television stations are Christian-oriented, like Family TV and Sayare TV, which illustrate the strong Christian culture of Kenya. The KBC continues to be the major televion choice though. They operate Channel 1, which reaches most areas of Kenya. The programming is usually educational, and highlights Kenya's local talent and culture. To compete with other entertainment channels, KBC has also launched a new channel called Metro TV. Other popular television channels are Citizen TV and Nation TV. These and most other channels in Kenya broadcast both local shows as well as international favorites. As in television, the KBC dominated the field of radio for most of Kenya's history. They still maintain a large presence, with their wide-spread KBC English Service and KBC Kiswahili Service radio stations. Like their TV programming, the KBC stations are focused on culture, education and news. Aside from the Kenya Broadcasting Corporation, there are several other options on the radio. Two of the most popular stations are Capital FM and Kiss FM, both of which feature music and entertainment shows. Other major stations include Christian-themed ones like Hope FM and Radio 316. Some of the radio stations are available only in major cities and their surroundings, but some (like the KBC) have a very broad range and can be picked up in even very remote parts of Kenya. Radios are an important tool to keep informed about the rest of Kenya, and the world, for many rural villages. Contrary to many other electric apparatus, transistor radios can run on solar energy. And like much of the modern world, the Kenya broadcasting industry has also taken to the Internet. Nearly all of the above-mentioned TV channels and radio stations have websites that offer viewers a chance to hear or see their programming though live feeds. This innovation means that people anywhere in the world can tune in and see what they are offering. NTV is one television station that is taking full advantage of the Internet for reaching a broader audience. They post clips from their news broadcasts on the popular video sharing site YouTube, extending their audience worldwide. Another Kenyan company taking broadcasting options to the Internet is A24 Media. It's a website that allows video journalists to showcase their footage, creating a sizable collection of independent documentaries. A24 actually covers all of Africa, but there are a large number of videos and shows from Kenya.